On the full‐moon night of Thursday, November the 14th, 1940 – 75 years ago today – the city of Coventry in the heart of Britain suffered one of the most intensely concentrated air raids of the Second World War, code‐named “Operation Moonlight Sonata”, after which 568 people were confirmed killed, 863 seriously wounded and 393 injured. The ancient city of Coventry was unusual in that industries had grown up within the town rather than in suburban industrial areas, making the relatively small city centre a target. It’s also suggested that Hitler was angry about the recent bombing of Munich. In any event, an estimated 449 bombers reached Coventry that night. The bombing continued for 11 hours, from the first incendiaries falling at 7:10pm until the “All Clear” sounded at 6:16am the next morning. The night was one of terror, repeated over and over. The great St Michael’s Church, only relatively recently (in 1918) made a cathedral, was destroyed, leaving only a shell (right) and its towering spire. The image below is typical of the devastation. It has been suggested that Coventry was not as well defended as it could have been: that the code‐breakers at Bletchley Park had discovered that Coventry was going to be the target that night, but that Churchill decided no additional action could be taken to protect the city in case it signalled that Britain had cracked the German coded messages. This idea is explored in Coventry‐born Alan Pollock’s powerful and moving play One Night in November (from which we take the name of today’s programme), which premiered in 2008 and has been staged regularly at the Belgrade Theatre in Coventry. However, this suggestion is quite definitely incorrect, as is evidenced by this article from Bletchley Park and this piece from the Churchill Centre. 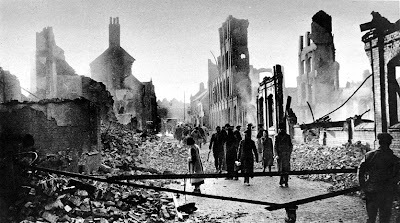 After the war, the centre of Coventry was rebuilt – virtually from scratch – and since then it has been at the heart of movements of international reconciliation, particularly centred around the Cathedral, which has reached across the world to others touched by the destruction of war — especially to the German city of Dresden in Germany, which suffered a similar fate. Today we are remembering the city and people of Coventry, and the victims of war. We’ll be playing music of the Second World War years plus some additional material, including Beethoven’s Moonlight Sonata, and Clive Richardson’s London Fantasia – originally titled The Coventry Concerto, which tells the story of a day in wartime Coventry in music, with the piano played by the composer, along with the famous Warsaw Concerto by Richard Addinsell, whose success inspired the former work. We will also be playing two songs written about that night in November, Greg Harper’s November Sky and Nigel Cuff singing Mike Cooper’s Moonlight Sonata. We’ll also be playing Symphony No. 3: Sorrowful Songs, by the Polish composer Henryk Górecki, and Philip Glass’s Violin Concerto, which appears in the incidental music for the play One Night in November. 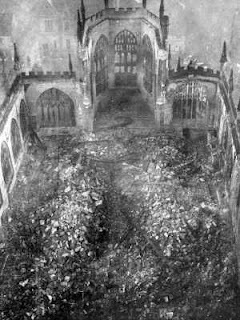 You can read more about the Coventry Blitz on the Council’s special 75th Anniversary web site – and about many other aspects of this great city’s history on the Historic Coventry web site. The image at the top of this article was taken from the gathering on November 14, 2015, the 75th anniversary of the bombing of Coventry, as part of the city’s commemoration of the event, which took place the day after the atrocities in Paris, hence the red, white and blue illumination.